Residents of the U.S. state of Oregon have an incredible and valuable natural resource. 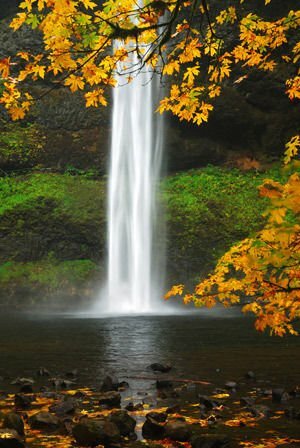 It goes under the name Silver Falls State Park, where you can see t 10 waterfalls, 5 of which reach heights of over 100 meters. Silver Falls, or silver waterfalls is named after its passing through Silver Creek. The park is located close to Silverton and about 32 km southeast of Salem. Silver Falls National Park is the largest in the territory of Oregon, and extends over an area of 36 square km. The park has over 39 km of hiking trails, about 23 km of routes for horse trekking and nearly 7 km trails for mountain bikers and downhill biking. The route that takes visitors to the park and the 10 beautiful waterfalls is called Canyon Trail and follows along Silver Creek, in which one after another line up beautiful natural formations. It gives the name of the area around the park in Oregon. The region has an area that is given to concessionaires, but it is strictly separated from the protected area. The Silver Falls City settlement was established around 1888, when a community was formed, which dealt with logging. Against this injustice was trying to fight the photographer June Drake, from Silverton, who used pictures of the beautiful waterfalls in the region, to awaken public consciousness. This action had its effect, but in 1926 the Inspectorate of the National Parks Service refuses protected area status to the area because it had an "unattractive distribution" of stumps. At the time of President Franklin D. Roosevelt, around 1935, Silver Falls began to develop as a recreation area. From about 1930 there is a tourist base and a historical South Falls Lodge in the area. In the middle of last century, this place got a restaurant, but by 1983 the whole area with Silver Falls entered in the National Register of historic monuments and sites. Since 2008 the place has the status of a national park. The most attractive and popular attractions of the park, of course, remain the waterfalls. Among these is the one located to the south hut called the South Falls, which reaches a height of 54 meters. As the highest waterfall in Silver Falls is considered Double Falls, which is about one meter higher than the second placed waterfall. Attractive is also Drake Falls. Four of the waterfalls have an amphitheater positioning.